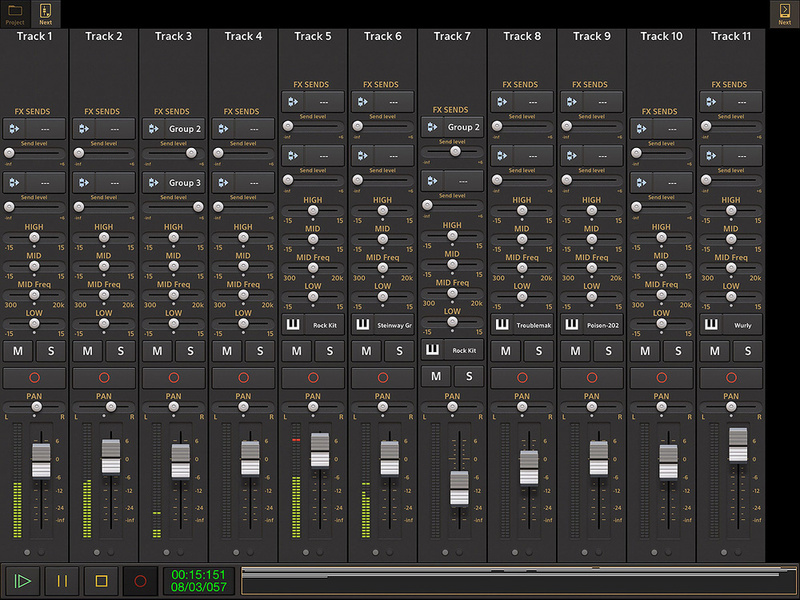 Audio Evolution Mobile Studio’s arranger screen adopts a pretty conventional take on the virtual recording system. While we have a large number of DAW/sequencers to choose from in the desktop world, mobile music producers are perhaps less well served. However, iPad-based music makers now have a new contender to sit alongside the likes of Cubasis, Auria Pro and GarageBand for iOS: Audio Evolution Mobile Studio from developer Davy Wentzler. And, if the software sounds familiar, that’s because it is a port to iOS of Davy’s Windows/Android DAW/sequencer of the same name. AEMS brings a pretty conventional approach to the design and UI. 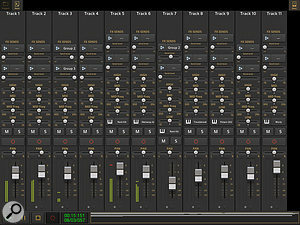 You get a fairly typical ‘arrange’ page, MIDI and audio tracks, piano roll and drum grid editing, basic mixing capabilities, options for creating additional bus channels (for submixing or for housing send/return effects), three insert effects and two effects sends per channel, basic automation options, and support for third-party IAA or AU apps, both as effects and virtual instruments. Core MIDI support allows you to use external MIDI hardware with appropriate connectivity, and suitable iOS-friendly, multi-channel audio interfaces are also supported. In short, this sounds like a pretty decent feature list. The Mixer options are presented in a familiar fashion with the usual array of fader, pan, EQ, insert and send effects options included.The other interesting choice made by the developer is the ‘free-to-try’ pricing model. AEMS is a free download and, while you are limited to just three tracks, it does mean you can explore before shelling out. The app then offers quite a number of in-app purchases, each of which offers further features. The obvious first candidate is the Pro Features IAP that essentially removes the track limitations and, as this only costs £$5.99, you then end up with a pretty solid DAW/sequencer for a very modest outlay. The bulk of the rest of the IAPs offer virtual instrument sounds and effects. If you went all out, you could spend a lot of money here but, usefully, you can also try many of these before you buy. Of course, you might simply choose to use existing third-party apps that you own for sound sources and processing. 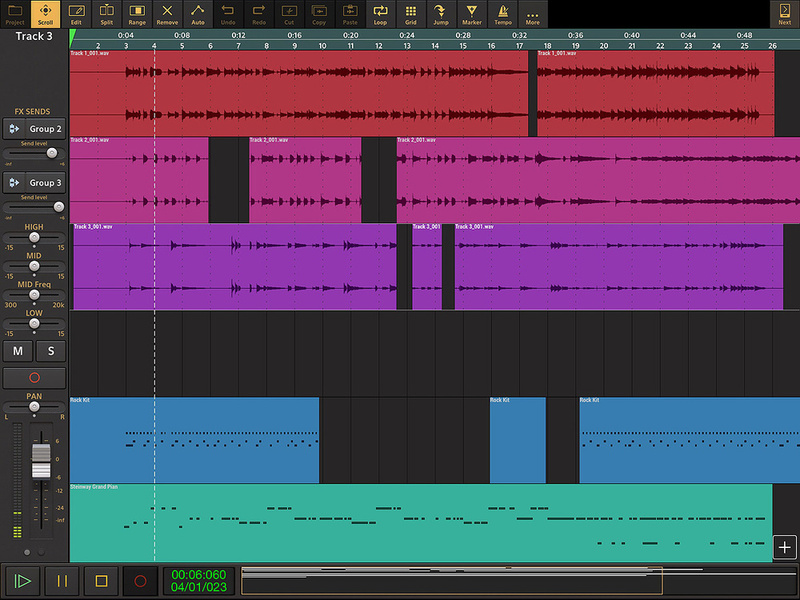 One advantage of the conventional approach adopted in the design is that AEMS feels very familiar to anyone who has used other DAW/sequencer software. This makes for a very shallow learning curve and, while there are a few rough edges in terms of workflow, there is nothing that will stop you getting work done or that could not be refined as part of the routine maintenance/update cycle of the app. Davy is clearly pretty keen on that front; even in the space of the week over which I explored the app, two new updates appeared on the App Store that solved problems some users (myself included) had experienced when hosting IAA effect apps within AEMS. It’s great to see a developer so responsive and open about their development process. I’m not sure AEMS would pull too many existing Cubasis or Auria Pro users away but, if you are looking for a first iOS-based DAW/sequencer and your budget is particularly tight, then Audio Evolution Mobile Studio — plus the Pro Features IAP — is well worth a look. And, unlike many iOS music apps, you can at least try before you buy.